12 oz. Stick/Bulk Cylinder Capacity / 1 oz. per 18 Stroke Delivery / 15,000 PSI / 1/4" NPT(f) Hose Outlet. 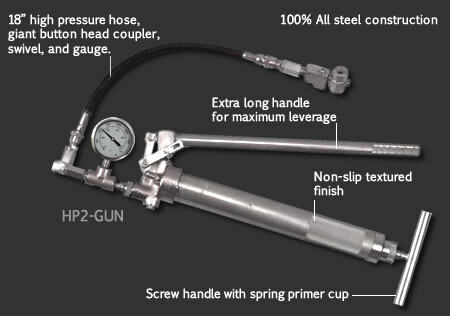 Gun is suitable to dispense grease, sealants, fluids, packings, and highly viscous lubricants. Each stroke of the lever provides automatic priming. Replaceable & repairable parts. Equal to Alemite P/N 6268-2. Made in America!